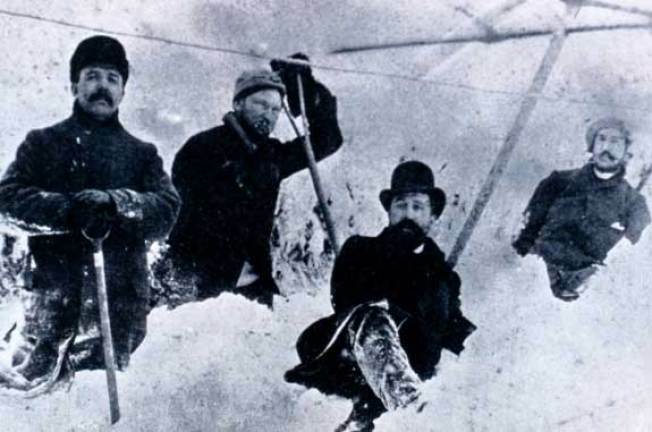 The Blizzard of 1888: The Original "Snowpocalypse"
Snow shovelers in Flushing, New York, during the Great Blizzard of 1888. On March 10, 1888, nobody saw it coming. Indeed, one weatherman, Elias B. Dunn, predicted that the weather for the next day would be: "Cloudy followed by light rain and clearing." He had checked with the Coast Guard station at the southern end of the East River and with Coast Guard stations along the eastern seaboard. And nobody expected that a calamitous storm was on its way. Dunn, whose office was on top of the Equitable Building at 120 Broadway, closed up shop and headed home to Brooklyn. It was a bad call. This had been the mildest winter in 17 years. And, as historian Edward Ellis noted, flocks of geese were honking their way toward Canada and there were red-breasted robins "skittering across green lawns." Indeed Walt Whitman had sent a poem about the first flower of spring to the New York Herald. Well, the next day, Sunday, March 11, started out allright. It was cloudy but warm, about 40 degrees. But then light rain came down, followed by heavier rain and then a cloudburst. The temperature dropped. Two separate storms, one from the north, the other from the south, zoomed into the city. Rain turned to sleet and then ice...and finally, amid heavy winds, a steady snow began to fall. Dunn had rushed back to his office and changed his forecast.. He now predicted a cold wave. Monday morning, the snow intensified and the city began to come to a halt. The mercury kept falling...and New Yorkers knew they were in for trouble. Julian Ralph of the New York Sun wrote: "The wind howled, whistled, banged, roared and moaned as it rushed along. It fell upon the house sides in fearful gusts, it strained great plate glass windows, rocked the frame houses, pressed against the door so that it was almost two dangerous to open them." And, Ellis reports, a Herald reporter said: "A horror of darkness deepened on the crowded city and the terror-stricken population cowered at the awful sounds which came from the throat of the whirlwind...The heavens darkened and a great roaring sound came from the thundering clouds. It seemed as if a million devils were loose in the air..."
So you think we got troubles! Remember, this was before the 24-hour news cycle and the journalism that gets ever more sensational. I think our ancestors could relate to the Blizzard of 2010 but they'd probably tell us it was nothing like the old days. Horse-drawn carriages were stalled in the streets, All traffic was blocked by snow west of Seventh Avenue. lA New York Central locomotive fell off its rails. Traffic on the Brooklyn Bridge was stopped. That blizzard was a lollapalooza.There are no figures on the number of deaths. But the cost was estimated as running into the tens of millions of dollars, a lot of money in those days. If there is competition between centuries, we are holding our own. But the Dictionary of American History still calls the Blizzard of '88 "the most famous blizzard in American History." And it's hard to dispute that -- especially since we weren't there. Fortunately.